Obama admin wilfully blind on Gaza crisis? Quick! Someone help free Pres. Obama from the kidnappers who are holding him hostage! The kidnappers in question are, of course, our old friends from the Israel Lobby, who have succeeded so thoroughly in their decades-long campaign to stuff the whole of the U.S. foreign-policy establishment with their acolytes and toadies that it seems that the President of the USA is currently unable to get any even halfway accurate information about the true situation in the Middle East. And thus, the only step that Mr. Rhodes and his boss the president see as necessary in order to end the conflict is that Hamas should cease its launching of rockets. Nothing about Israel taking any steps whatsoever to halt its massive, sustained use of lethal violence against Gaza. The two leaders discussed ways to de-escalate the situation in Gaza, and President Obama underscored the necessity of Hamas ending rocket fire into Israel. My first question is, why this blindness? Well, I guess that’s easy. Time was, back in the old days, when there were people in the White House and in positions of influence in the State Department who understood the broad dynamics of Middle Eastern politics and who had a well-grounded sense of what, broadly speaking, the American people’s interests in the region were. Back in the day, “even-handed” used to be a term of praise for U.S. officials involved in the sometimes complex work of negotiating issues between Arabs and Israelis. A self-imposed blindness became the order of the day in Washington. And today, that blindness matters. The Middle East of late 2012 is not, it turns out, the same as the Middle East of 2006 (the days of George W. Bush, Condi Rice, and the “birth-pangs of democracy” criminality over Lebanon.) It is not even the same as the Middle East of 2008-09 when– as in 2006– an apparently strongly seated Pres. Mubarak was still in power in geopolitically massive Egypt, able to extend his support over other, more fragile U.S. allies in the region like the PA’s Abu Mazen and Jordan’s King Abdullah. Hullo! Perhaps someone should tell Pres. Obama and his minions that, um, something rather serious has changed in Egypt over the past 22 months? Don’t under-estimate the effects of such sojourns, and of the reporting thereon, dear Mr. Ben Rhodes. So today, Elshamy is in Gaza. Today, he posted this slideshow onto the U.S. website Foreignpolicy.com. U.S. officials don’t even have to know Arabic to be able to appreciate the impact of his photos and their (English-language) captions. But imagine how much more they might understand about the geopolitical dynamics of the whole region today, if regional knowledge had not been systematically besmirched and derided by the past 30-plus years of campaigns by AIPAC and its allies? Actually, it doesn’t even require a Ph.D. in area studies, or anything close to it, to understand such things. All that’s required is a recognition that you can’t carry on privileging the claims, interests, and assertions of 6.5 million Jewish Israelis over those of their 300 million neighbors forever and expect that situation to be stable and sustainable. To imagine that that might be possible requires a certain, very extreme kind of colonial (and essentially racist) blindness! If there is to be a ceasefire that works for Gaza– as I so sorely hope– then evidently, it has to be reciprocal. It is strongly preferable, in addition, that some neutral monitoring mechanism be in place. And it is absolutely necessary– for the sake of the 1.7 million Palestinians of Gaza, and for all Israelis and Palestinians everywhere– that a decent and sustainable end to the longstanding conflict between the two peoples be attained in the shortest possible time. For 39 years now, ever since the Geneva Conference of December 1973, Washington has successfully maintained its monopoly over all Arab-Israeli peace diplomacy. The record of this tenure has been especially poor regarding the crucial Palestinian strand of the effort. Over the past 39 years, the Israelis have implanted 500,000 settlers into the occupied Palestinian territories. They have maintained total control over all of the West Bank (including East Jerusalem) and Gaza. They have killed several tens of thousands of Palestinians– between Lebanon, Gaza, and the West Bank– and have displaced hundreds of thousands more from their ancestral homeland. They have completely transformed the human geography of Jerusalem. They have refused any attempts by the eight million or so Palestinians living in exile to return to their homeland. Palestinian acts of violence over that period have killed some hundreds of Israelis. Every so often throughout the past 39 years– and especially in the aftermath of a flare-up of tensions– Washington would trot out some version or another of a new “peace initiative”, or even (heaven forbid!) a peace “process”, involving the Palestinians. All of it was flim-flam, smoke and mirrors whose main effect (and in some cases, also the intention) was to give the Israelis more time to continue their colonial taking of the Palestinians’ land and resources. It is time to end that charade. Time for the grown-ups in the world system to take the reins away from Washington and work to speedily find and implement a solution to the Palestine-Israel question that is based on international law and a respect for the basic equality of all human persons. … But first, we need that two-sided ceasefire in Gaza. Two-sided. How blind must this U.S. president be if he can’t understand that? Author HelenaPosted on November 21, 2012 Categories US foreign policy3 Comments on Obama admin wilfully blind on Gaza crisis? Fundraiser for key new book on Iran– please help! As some JWN readers know, twelve days ago I launched an online fundraising campaign to support the writing and publication of one of my company’s most important books for 2013, a book by award-winning investigative reporter Gareth Porter that exposes how the U.S. and Israel have “manufactured” the whole scare about Iran’s alleged pursuit of nuclear weapons. 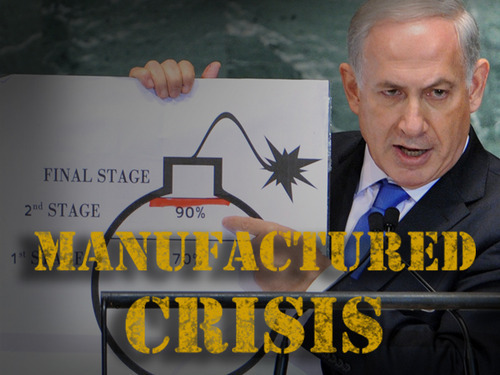 The book will be called Manufactured Crisis: The Secret History of the Iranian Nuclear Scare. Gareth, who in June traveled to London to receive the Martha Gellhorn Prize for Journalism, is uniquely qualified to write this book. You can see more details about his qualifications over at the fundraising page. But he needs some financial support if he is to take time out from his continuing duties as a cutting-edge investigative reporter, and pull together the huge amount of material that he has amassed, into the form of this very sorely needed book. We want, obviously, to get the book out as early in 2013 as we can… But it still all needs to be written! My company, Just World Books, has given Gareth a small advance. But he needs quite a lot more support, if he is to be able to devote the time that this project needs– and to do so, starting in early December! We don’t have access (as the vast majority of the warmongers and scaremongers do) to huge gobs of funding from foundations or think-tanks. So this has had to be a “people’s” fundraising campaign; and in a way I’m very glad about that. The fundraising platform that we’re working with, Kickstarter, has a generally good format. But it has an important feature that we all need to know about: Anyone launching a Kickstarter campaign has to designate both an end-date, and a target amount of money that she or he wants to raise before that end-date… And if the pledges made to the campaign as of that date don’t meet the target, then none of the money gets collected! From the point of view of a project’s backers, that is probably a good thing. It means that you don’t end up pouring money into a project that never gets fully funded and that may therefore never get completed. From our viewpoint as the project’s authors, however, it means we absolutely need to meet the $10,000 fundraising target we set, before December 12, which was the cut-off date that I designated. If we don’t reach the goal by then, not only we don’t get any of the money pledged, but also, I think we don’t even get access to the contact details of the pledgers, to ask them if they could find a way to support us, anyway. Right, I agree that that latter aspect of the Kickstarter system seems really horrible. But the Kickstarter folks are quite right to stress, as they do in some of their literature, that running a successful fundraising campaign takes time and energy; and that people who are planning creative projects should try to be strategic about minimizing the amount of time they have to spend fundraising. So let me ask all of you readers of JWN to help us meet our goal. This is not a “charitable” endeavor. It is a serious pitch for backing for an important publishing project… and we’re offering a graduated series of worthwhile “rewards” to everyone who contributes $10 or more. You can check them out on the right sidebar of the Kickstarter page there. When I was planning this fundraising campaign, I decided it should run for 42 days. We launched it on October 24. We knew it would be hard to get much attention for it during the lead-up to and immediate aftermath of the U.S. election. But now, the election has finished and all the dust that it raised has settled. The fact that Pres. Obama won re-election does not mean at all that the threat of continued tensions and future, perhaps sudden, escalations between the U.S. and Iran–or, between Israel and Iran– has gone away. Today, according to the Kickstarter page, we have 29 days left for our campaign. (I would have pegged it at 30 days, but never mind…) And we are already 22.6% of the way towards our goal. My huge thanks to everyone who has expressed their support of this project– and their confidence in Gareth and me– by pledging, so far! But we still need to raise the remaining $7,740 by December 12. Kickstarter will accept pledges in any amount from $1 up. We offer good rewards, at pledge levels from $10 right through $1,000. If you haven’t pledged yet, could you consider doing so? Pledging can be done quickly and simply through the Kickstarter page. In addition, we’d appreciate anything you can do to help us spread the word about this fundraising campaign. There must be many ways in which, for example, you could tell your friends about it, and urge them to make a pledge, too? If you’re on Twitter and want to tweet about the campaign, we’ve created this handy short URL you can copy and use: http://bit.ly/ManufCrisis… Actually, anyone can use that short URL, which is a whole lot easier to remember or copy than the long version. And let’s not forget physical-media ways of doing outreach, either. I’m just about to make some print flyers about the campaign, to start handing out, including at the annual conference of the Middle East Studies Association of North America, which runs in Denver, Colorado, this weekend. Let me know if you’d like me to send you the PDF of the print flyers, so you can distribute some, too. …So please, give us all the help you can. We need this fundraising campaign to succeed. That way, Gareth can get started very soon on the deep, sustained work that is needed to pull together all the materials he has collected, into this important book… And we can then know that this book can make a real contribution to setting the record straight on the lies, manipulations, and actual DIS-information on this issue that too many in the “west” have been subjected to, for far too long. Author HelenaPosted on November 12, 2012 Categories Iran, Nuclear weapons, US foreign policy, Writing and publishing2 Comments on Fundraiser for key new book on Iran– please help! I apologize that I got too busy doing book publishing over the past few days to comment directly on the shameful decision by the Obama administration to veto last Friday’s Security Council resolution that condemned Israel’s continued settlement building program. Answer: They weren’t doing any real-world strategic “thinking”, as such. They were triangulating their chances of being able to retain AIPAC’s powerful financial-aid program through the next electoral cycle here in the U.S. (Which– hullo!– we’re still at the very beginning of, anyway. Luckily, others have written good analyses of what was happening. Including Steve Walt, and Glenn Greenwald. There are many other ways, too, in which the heavily militarized and diplomatically tone-deaf policies that Washington has pursued for many years now toward the majority-Muslim parts of the world (and elsewhere) have ended up actually undercutting the American people’s interests around the world. And now, with Washington continuing these policies in an almost completely solipsistic way, the imperium that the US military has been maintaining throughout (and over) most of the Greater Middle East is crumbling more and more visibly every day. In Afghanistan, NATO (most likely U.S.) air raids have been busy killing scores of people in Kunar province (as noted by Greenwald)… and the very best case anyone can make as to how the U.S. could be described as “winning” this war, as made here yesterday by Fick and Nagl, was just a mishmash of wishful thinking. In Tunisia and Egypt, the U.S. has lost the compliant, totally toadying leaders it had been relying on for many decades– and whatever governments now get formed in those countries will have to be a lot more responsive to the popular will than Presidents Ben Ali and Mubarak ever felt they needed to be. Libya is in the middle of an extreme, megalethal crisis. Right now. With citizens being mowed down in their hundreds by a gun-happy military. Bahrain– home to the U.S. Fifth Fleet– is in the midst of huge upheavals. There is, indeed, too much going on right now to make easy or swift sense of it all. What is clear, though, is that throughout the Arab parts of the Middle East, a new spirit of liberation and self-empowerment has been unleashed that will change the politics of the region forever. What is also clear is that the the great big structures of war-fighting that the U.S. has supported throughout the Middle East, and the actual wars it has waged within it, have done nothing to protect the interests of the American people, but rather, have massively undercut our ability to have sane, friendly relations of mutual respect with the peoples of the region. And that is even without looking at the vast financial burden that all this militarization has imposed on us. Add that in, and the true craziness of the way our policies have been militarized since 2001– under George W. Bush and also under Obama– becomes stunningly, tragically clear. Time for a large-scale “re-set” in our priorities. the supposed remedy of a ‘military solution’ would be more unacceptable [than the things that might predictably happen if Iran does get a nuclear weapon.] A bombing attack on Iran’s far-flung, fortified nuclear facilities… would be the start of a war of unknown duration and immense human, material, and political cost… In the past decade, we have been drawn [he does not say by whom] into two wars on Muslim soil. Both began with promises of quick and nearly bloodless (for us) ‘victory.’ Neither has ended. We cannot afford a third. However, Hertzberg then goes on to argue for a repeat of the containment policy that the U.S. pursued toward the Soviet Union from the late 1940s until the largely peaceful (well, peaceful for the U.S.) collapse of the Soviet Union from the late 1980s on. However, if (as Hertzberg advocates) the people of Iran are to be successfully persuaded that following the path of the peoples of the former Soviet Union and bringing about the end of their current political system would be a wonderful thing for them (as well as for Americans), then this would have been a much more persuasive argument had the U.S. actually been a more generous and visionary ideological “victor” in the U.S.-Soviet Cold War. In this regard, Pres. George H.W. Bush looks to have been a lot more skillful, smart, and persuasive than Pres. Clinton. It was Bush Senior who famously noted to Pres. Gorbachev in 1990 that he “wasn’t dancing on the ruins of the old Berlin Wall,” and who also reassured Gorbachev and the Russians that he had no intention of extending NATO further to the west. But after Bill Clinton became president in 1993 he did just that. He also worked through the IMF and other international financial institutions to force on the Russian people a humiliating dismantling of their social safety net that pushed millions of formerly middle-class former-Soviet families into poverty. Actually, the idea that in the 21st century the U.S. even has the global clout to mount and maintain– even against a decidedly second-class country like Iran– a replay of the Cold War it maintained for for more than 40 years against the USSR is already a chimera. Washington just doesn’t have that kind of global clout or that ability to assemble and maintain world-circling coalitions that it had throughout the second half of the 20th century. Our country’s ability to influence events around the world is in tatters– and this was already the case before the latest round of Wikileaks started to dribble out to the public. Yesterday there were “elections” in Egypt and Haiti, two countries deep within the U.S. sphere of influence. Both elections were deeply flawed in terms of the most basic norms of democratic accountability and fairness. And both did much more to reveal and exacerbate the deep social and political crises in the countries in which they were held, than they did to resolve differences peacefully and to establish governments capable of providing real public security and other essential services to their citizens– outcomes which are, to be sure, among the basic benefits of a well-run democratic system. In Central and Eastern Europe, the countries of the former Warsaw Pact followed more or less that script. But in 2004-06, when Condoleezza Rice tried to extend the model to Iraq, Egypt, and Palestine, she got a rude shock. Citizens in those countries, given anything resembling a free vote, tended to support strongly anti-American candidates. After the relative victory of the Muslim Brotherhood in Egypt’s parliamentary election of 2005 and the outright victory that Hamas won in the Palestinian parliamentary election of early 2006, Washington’s support for the export of formal democracy to most of the Arab world stopped in its tracks and was, indeed, abruptly reversed. In Egypt, the presidential election of 2006 was held under restrictive rules that met no protest from Washington– as were the parliamentary elections held yesterday, which were a mockery of any idea of fairness. In Palestine, after the 2006 election, Washington abruptly joined with Israel and a faction from the losing Fateh party to combat and plot the overthrow of the democratically elected government. In this context, it was interesting that in Iraq and Afghanistan, the U.S. and the rest of the (U.S.-led) “international community” persisted with the idea that some form of formal democracy should continue to be pursued. In Iraq, Washington’s motivation seemed to be mainly to establishing something– anything!– that could be said to be a positive fruit of the decision to invade the country in 2003. In Afghanistan, Washington evidently felt it needed to conform to the pro-democracy philosophy of the NATO alliance whose military help it so sorely needed. Thus, anyway, we had the November 2009 presidential election in Afghanistan, which was a deeply flawed process. And then in March this year we had the parliamentary election in Iraq, which was procedurally far less flawed than the Afghan election– but which resulted in a tough political impasse that has left the country effectively without a government ever since. Then yesterday, there were parliamentary elections in Egypt and presidential elections in Haiti. Both are countries in which U.S. influence has been both longlasting and deep. Haiti is a country now mired in multiple, extreme social and humanitarian crises– to which the wide spread of cholera has now been added. Former President Bill Clinton has been the UN’s “special envoy” for Haitian reconstruction ever since the earthquakes of January. But what has he achieved? What has the diplomacy of his wife, Hillary Clinton, and her boss, Pres. Obama, achieved for the people of Haiti? In Egypt, there is also a deep crisis of governance– though thankfully, until now, not one that has had the same dire human consequences as the crisis in Haiti. But in both countries, the deep flaws in the way the elections have been conducted are a clear mark of the failure of U.S. diplomacy. When elections held in countries where the U.S. is influential go “well” procedurally, Washington is the first to take the credit. On this occasion, in both Egypt and Haiti, Washington must bear considerable responsibility both for the flaws in these elections and for the deeper crises of governance that underlie them.